Last year, Andrew Smith wrote a book that had: weird science, boys who talk about masturbation, an incredibly strong voice, and strange animals created by the aforementioned weird science. Love it or hate it, we couldn’t stop talking about it. So why is The Alex Crow, which could also be described as a book with weird science, boys who talk about masturbation, an incredibly strong voice, and strange animals created by the aforementioned weird science, making so little ripple? Backlash against Smith’s problematic writing of women? (It’s not better here, exactly, but used as part of the absurdism and thus ameliorated.) The fact that he JUST received a Printz honor? A less astounding package? Or does The Alex Crow suffer because it feels like it’s not original, even though the thing that makes it seem less original is the same author’s work? Today, let’s revisit two of our Pyrite 11 that both have at their cores events that forever change their protagonists. 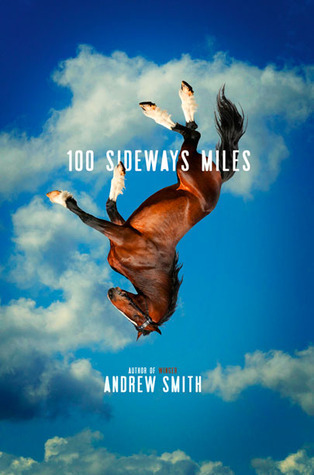 I am, of course, talking about Jandy Nelson’s I’ll Give You the Sun and Andrew Smith’s 100 Sideways Miles. This book. This book! I loved it. Also I hated it. It has amazing characters, and then it has crimes against female characters. It’s A Tale of Two Cities for me on this one — this book contains multitudes and also contradictions galore. It probably deserves an award, except when it doesn’t. There’s a reason I’ve been dragging my feet on writing this review. Actually, reasons. Lots of them. This is an extraordinarily impressive book. Except when it isn’t. ARGH!